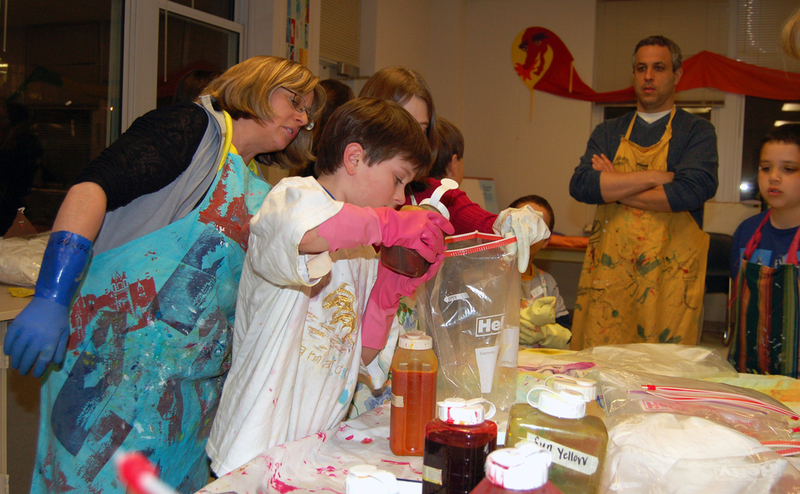 My work as a teaching artist in the schools has been focused on inviting students to become authors and illustrators and sometimes sculptors. 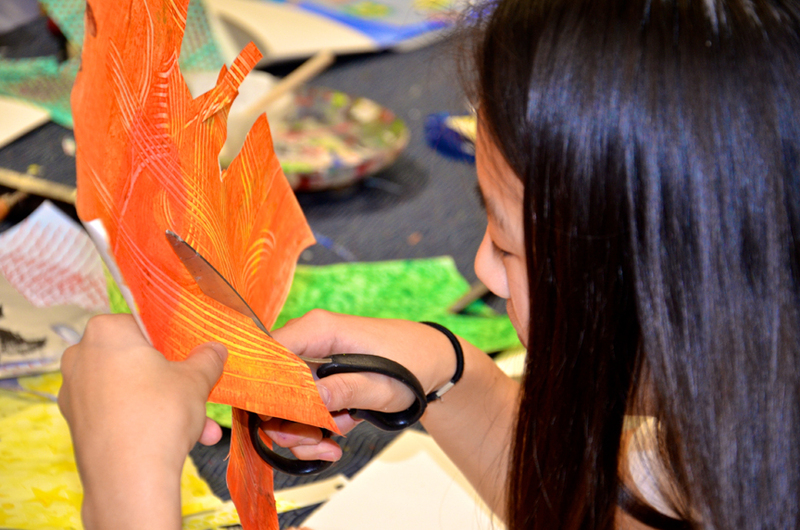 I provide a curriculum of playful and interactive studio activities that integrate color, pattern, symbol with collage, poetry, and prose. 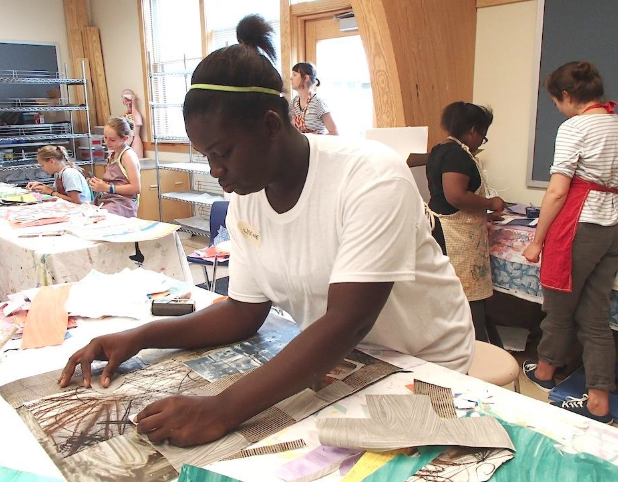 Whether working on paper or cloth, participants learn to see like illustrators, value words as writers, and actively engage in developing a thoughtful and enduring narrative. 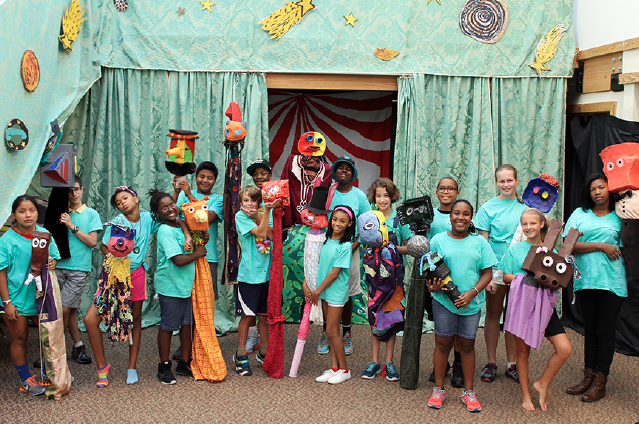 Residencies have resulted in pop-up books, oversized puppets, published picture books, and story quilts and textile installations. 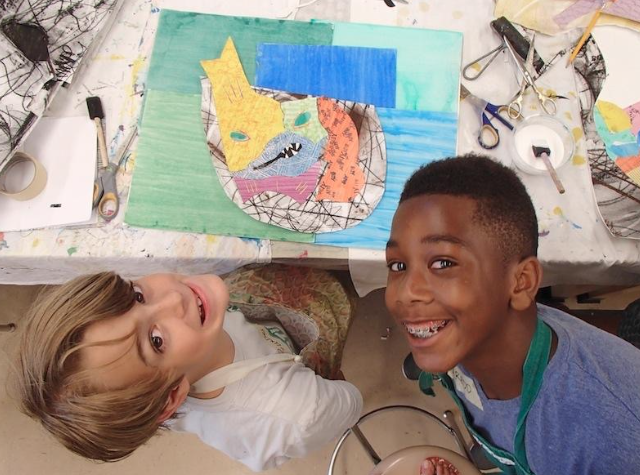 Projects often include collaborations with other teaching artists allowing for story expression to span multiple disciplines (writing, dance, theater, music). 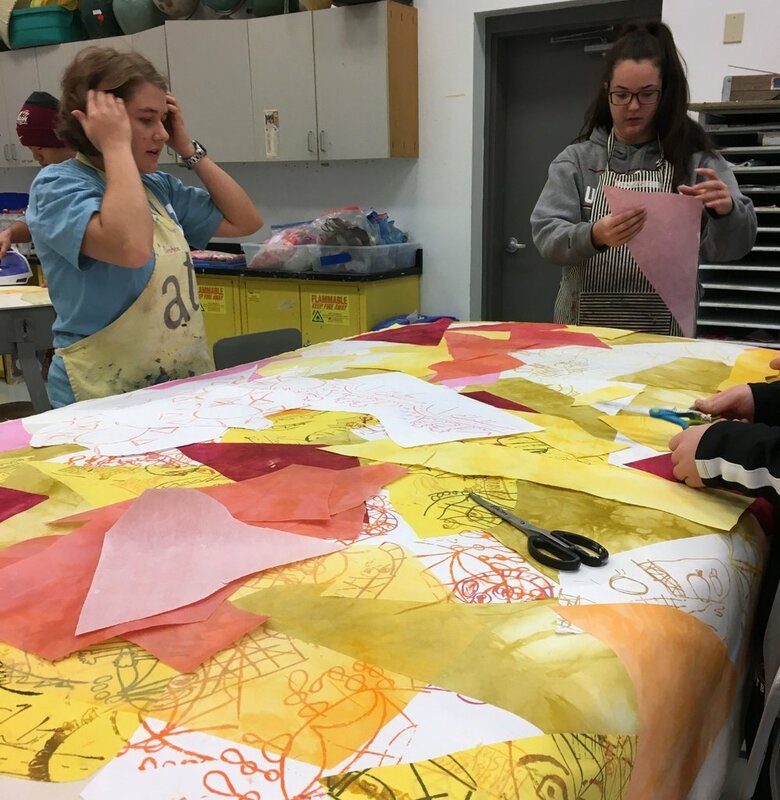 During Elon Winterterm 2019, my sculpture students explored color and translucency with ink, paper, silk and thread creating a large floating installation; Paperscape. The students worked collaboratively and individually to answer the design challenge of activating the Elon Gallery with a fiber based work. 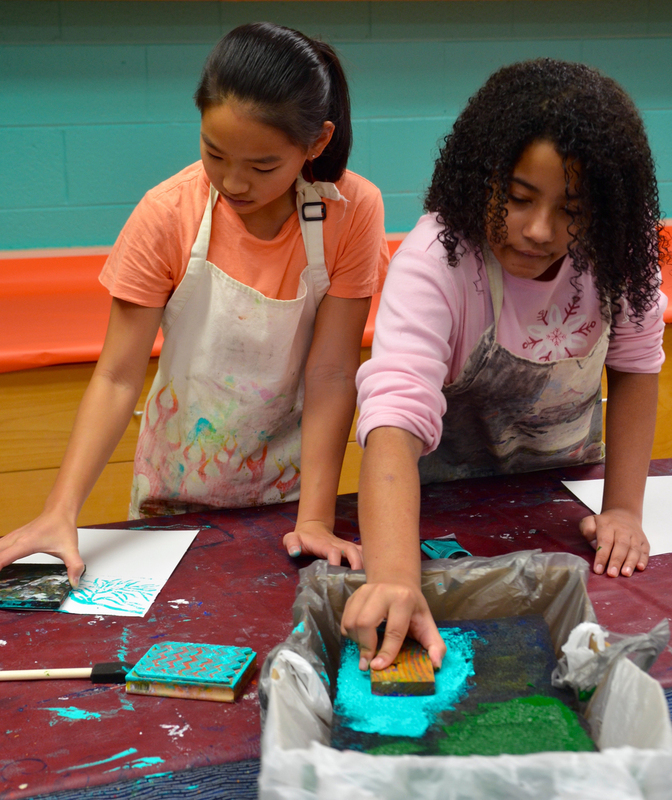 Using a simple monoprinting process, students created 100 strands of printed cloth and paper using only pine needles as a way to make interesting marks. 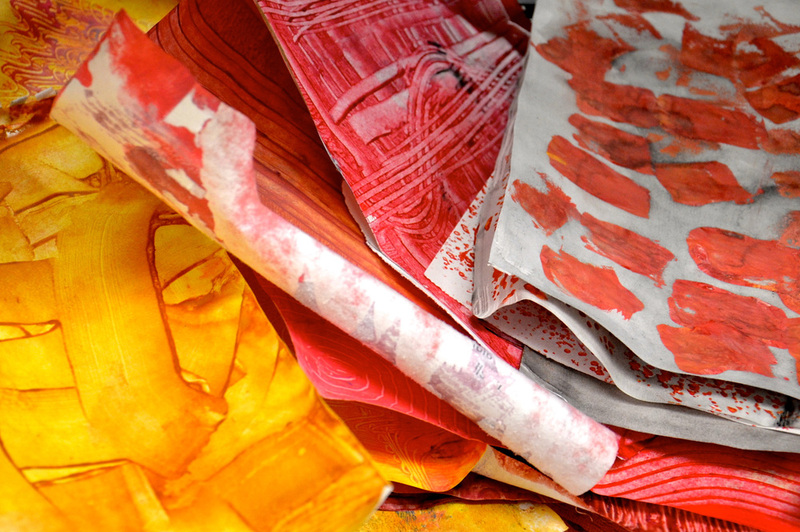 Paperscape will travel and be reinterpreted in a new setting in Greensboro. 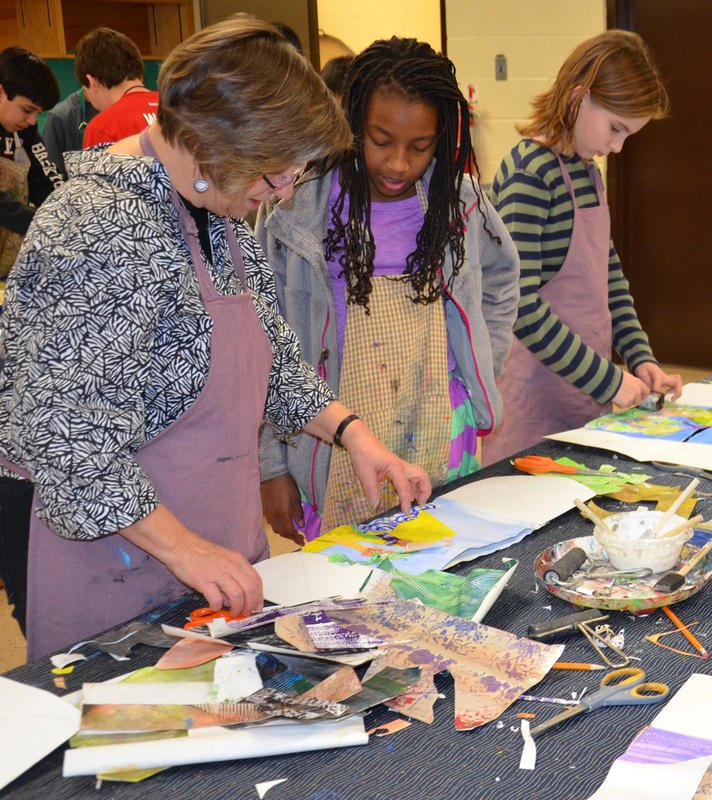 Textile Arts Residency with Billingsville -Cotswold Elementary School, Charlotte, NC. Funded by Myers Park Presbyterian Church. 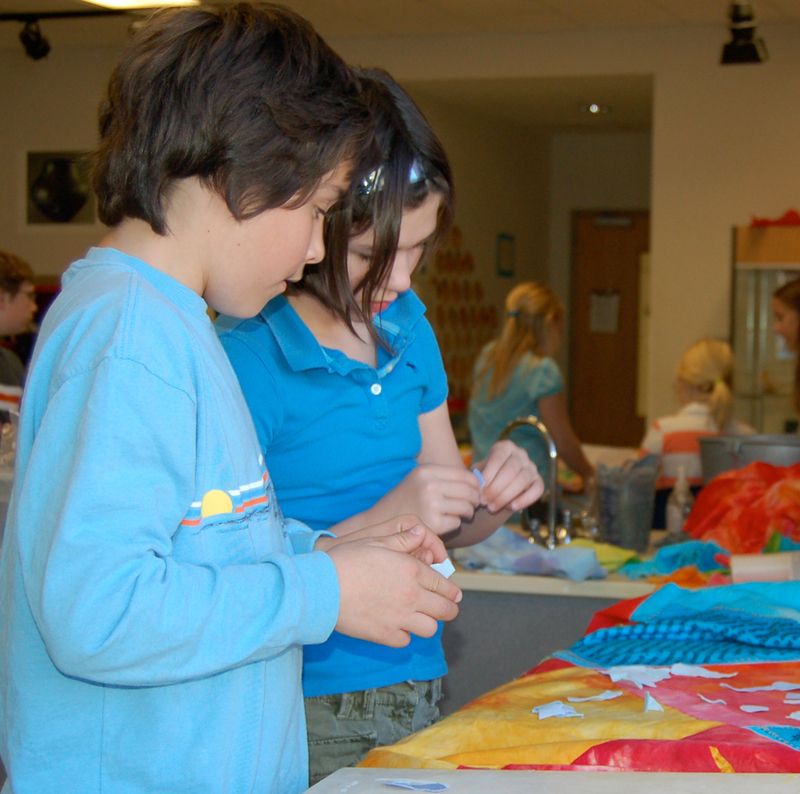 The Star Project, created with Elon University Art students enrolled in my Approaches to Sculpture: Fiber Construction course offered during winterterm 2017, generated 400 stars for Erwin Montessori Elementary School, Greensboro, NC. 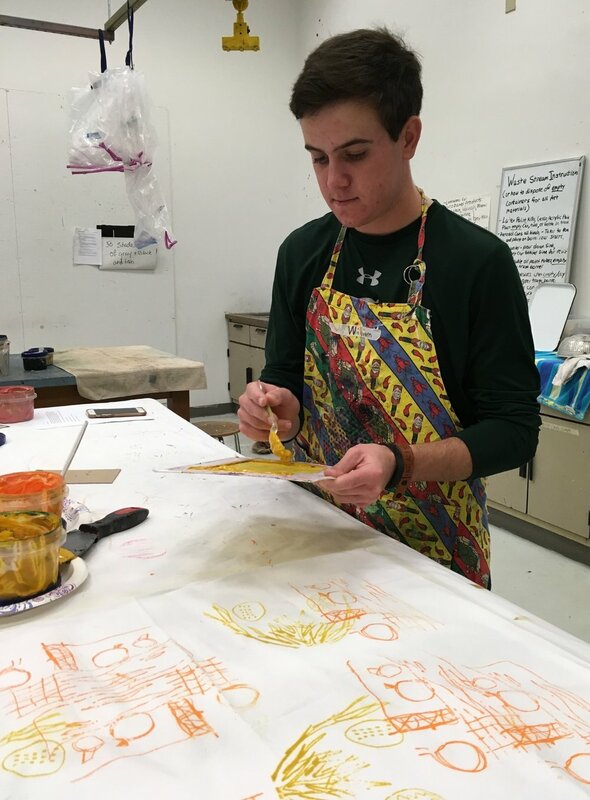 Elon students worked collaboratively to dye cotton and silks, screenprint children's drawings gathered from Erwin's Art Room, creating large 2-sided fabric collages. Each student learned how to machine stitch; sewing with abandon and then with precision. 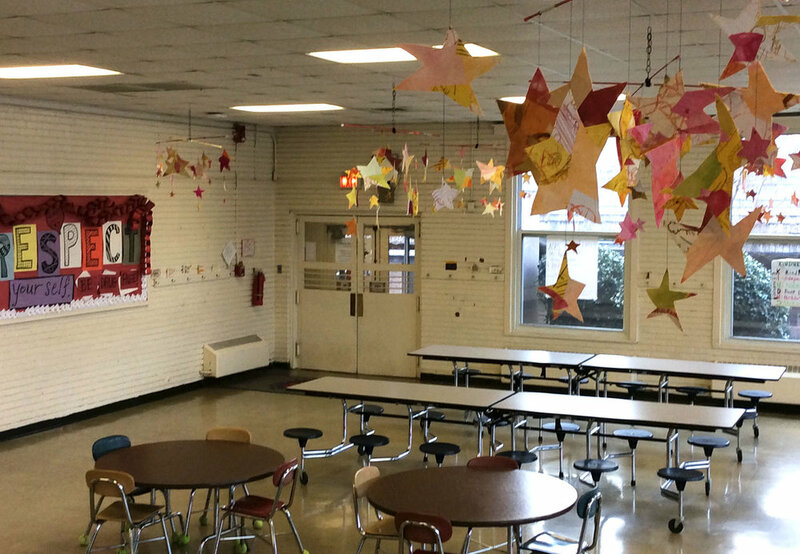 Together they produced twenty constellations of stars that transform Erwin's spacious school cafeteria. I offer book arts residencies that include secret rooms, spiral and accordion structures. 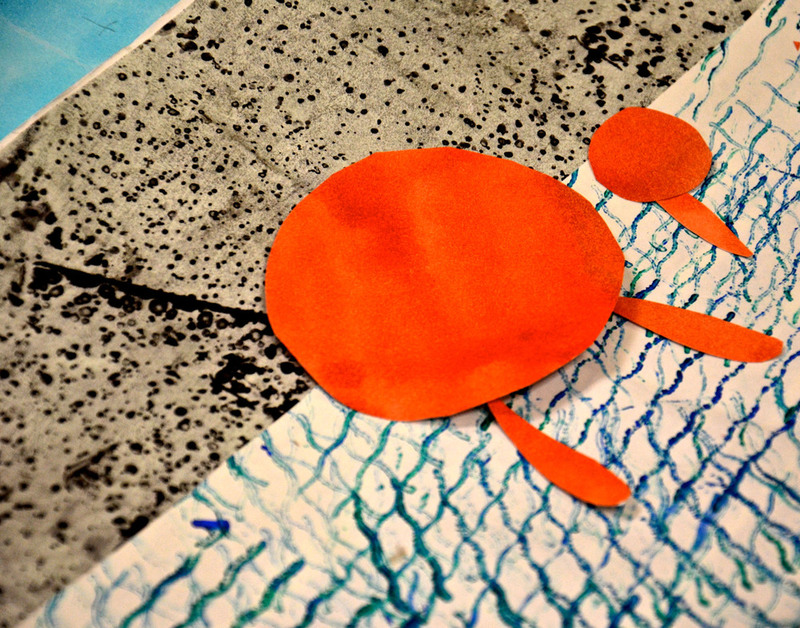 Students create brightly patterned papers via simple printing and painting techniques and blending words and pictures via collage. 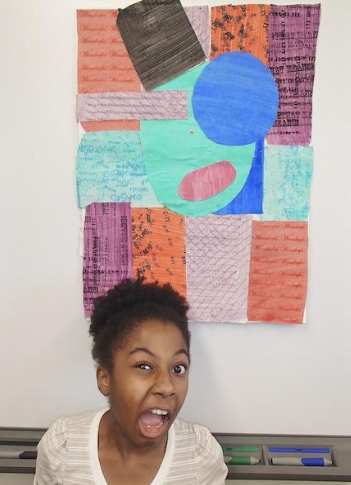 Featured below: Hero Books by Durham Academy 6th graders whose work goes on view at the FRANK Gallery, Chapel Hill, NC each March. 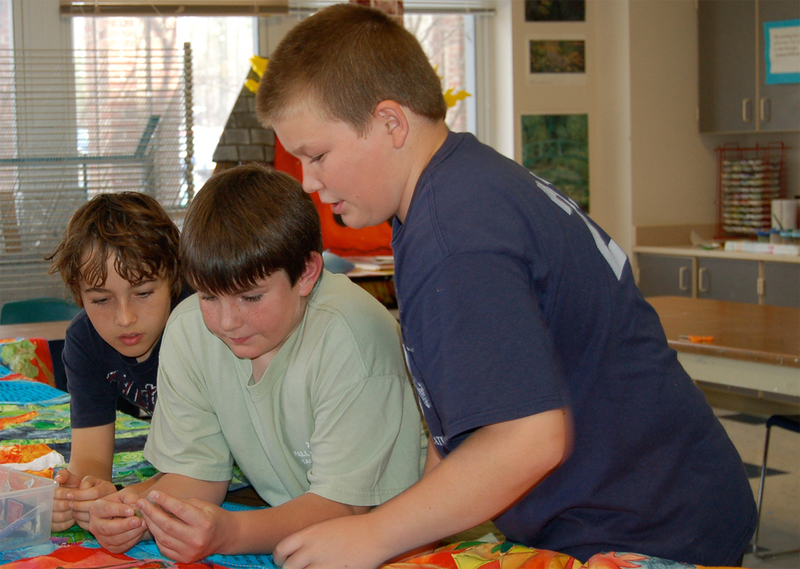 Learn more about all my projects IN THE CLASSROOM.